Summary: Josh didn't like that this was happening to him. He didn't know how to stop it. Summary: Josh's house turns against him. Hilarity ensues. Summary: Things are said, mistakes are made, but it all works out in the end. Summary: Sam's addiction was Josh. Summary: Don't trust anything that happens in the middle of the night. Notes: Many thanks to Jackie Thomas, who took a look at this when it was mainly just nonsensical dialogue and got me to stop being a lazybones and make the story, you know, coherent. Summary: Everything came up blue. Notes: I may have played with the timeline of the campaign just a tad, but go with me, it works. Summary: Still hearing your voice in the night. Summary: A phone call, a lightning storm, something that was almost Mars. Summary: And Sam reminded himself again that this was a different world, and one that had always felt like home to him. Summary: It is very complicated inside Josh's head. Summary: In search of spring, and something to believe in. 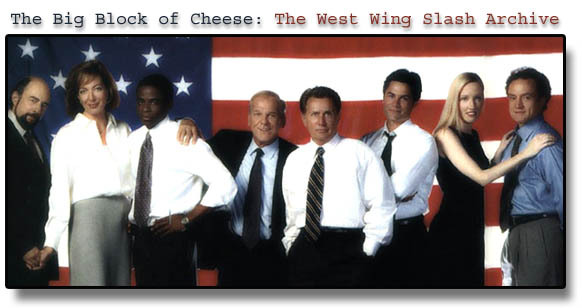 Summary: So, this is the thirteenth West Wing story I've written. It's about omens and vibes and stuff, as befits the thirteenth of anything. Summary: On a non-linear timeline, Josh and Danny have several conversations, in addition to other stuff.